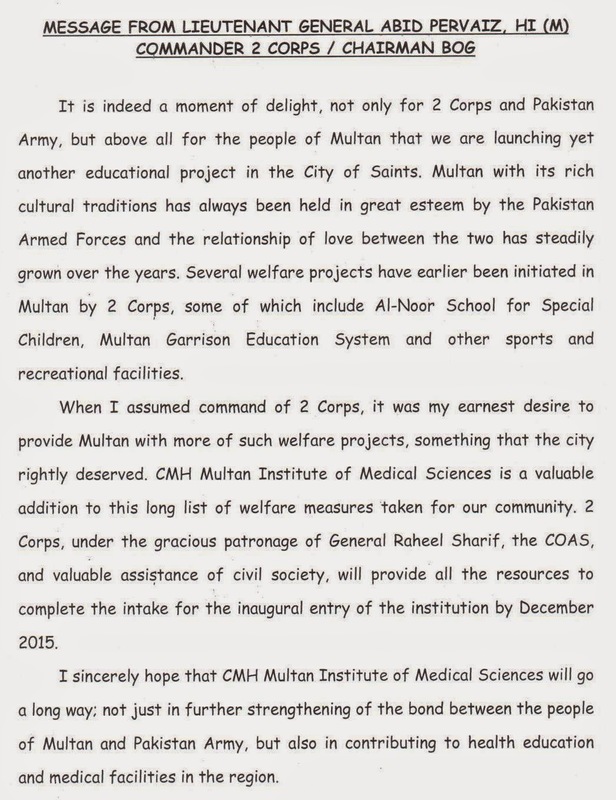 Truth by Kbaig: “CMH Multan Institute of Medical Sciences” – A Milestone in the Educational Development of South Punjab! 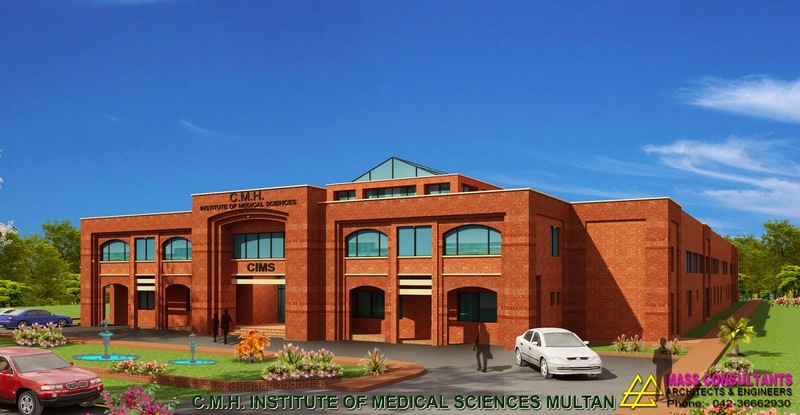 “CMH Multan Institute of Medical Sciences” – A Milestone in the Educational Development of South Punjab! If one talks about the under developed areas in the Punjab, one ultimately considers districts of South Punjab which is the backbone of economy of not only Punjab but Pakistan as well due to its agricultural produce but this region is devoid of the fruits of development which cities of Upper Punjab or the Provincial Capital. I do not mean to complain against a party or its leadership, I am not jealous of development of the other as wherever development starts as a Pakistani it is our development. But when people of South Punjab visit cities of Upper Punjab they are forced to think that why are they deprived of all such facilities? Deprivation of our region is not only in the form of the wide roads, green belts around the roads and skyscrapers but shortage of standardized educational and medical facilities as well. Those families who can afford are forced to move to the Provincial Capital so that their children may get good education, provide them healthy and good environment and plenty of chances for a safe and better future. Our region not only has shortage of standardized basic educational institutions but of professional institutes as well. Especially in the field of health, neither new hospitals nor the medical colleges have been established keeping in view the increasing ratio of population. Due to the shortage of available seats in Medical colleges, students of South Punjab fail to meet the requirements of the merit and are deprived of the education. If we look at the three divisions of South Punjab i.e. Multan, Bahawalpur and Dera Ghazi Khan; it has the 31% of the total population of Punjab and 48.5% of Punjab’s total land; meaning half of the Punjab. Moreover, Multan is the 5th largest city of the Pakistan. Here we have total 4 Medical colleges out of which one private college has recently been started. In contrast to the situation of South Punjab the rest of the Punjab have 37 Medical colleges out of which 22 are private and 15 are govt. These figures clearly show how students South Punjab are being deprived of their basic right to education. Last year total 42000 students applied from Punjab for the admission out of which 9140 applications were from South Punjab while rest were from Upper Punjab; out of these 1325 students from South Punjab while 4975 students from Upper Punjab were given admissions. Here this is a grave reality that Pakistan is suffering from the shortage of qualified doctors. According to the report of the Joint Learning Institution (JLI) Pakistan needs more than 450,000 doctors while at that time Pakistan has 172,289 registered practitioners. On the one hand public is facing shortage of 277,711 doctors while on the other hand the issue of brain drain is also a bitter reality. The solution of this situation is possible through establishment of more Medical colleges. 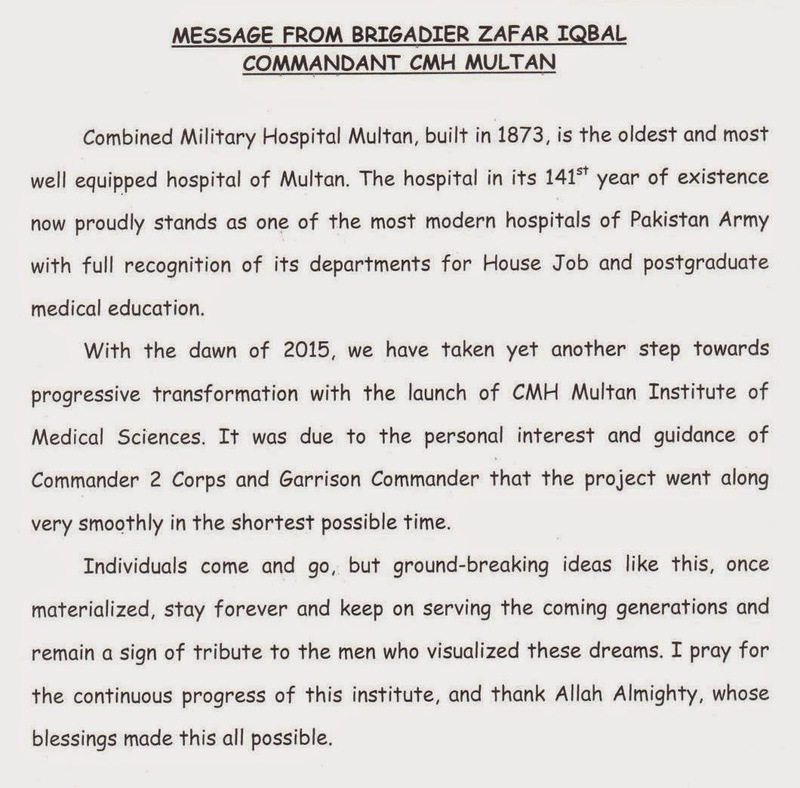 Keeping in view this ground reality, Pakistan army has decided to establish a medical college namely “CMH Multan Institute of Medical Sciences” (CIMS). Pakistan army’s role in the development of South Asia is not a secret. Multan and Bahawalpur’s Cantonments, the business activities in these areas, cleanliness and safety of these areas speak itself. Moreover, Pakistan army’s services during floods are appreciatable. Now the establishment of Medical College would prove to be a milestone in the development of this area. The basic need of the Medical College was the piece of the land not only for the construction of the classrooms and laboratories but for the dormitories as well. 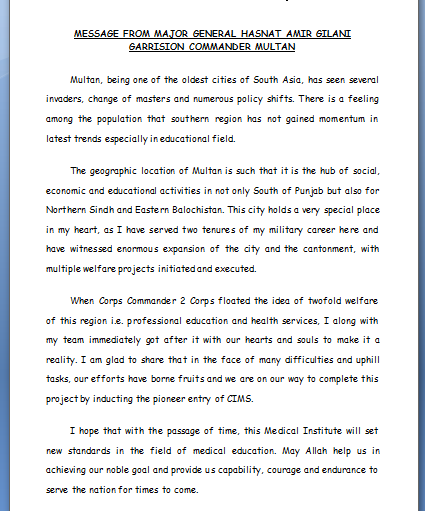 For this purpose Pak army has provided landed within the Multan Cantonment in front of the CMH Multan. The construction work is going on rapidly. This construction would be completed in 2 steps; in the first step, army has also earmarked few barracks along with 60 thousands square feet land for the building of the college so that admissions can be started from September-October 2015. One hundred seats have been fixed for the admissions in the CIMS annually. Initially, the educational activities would be held in the earmarked barracks in front of CMH Multan and newly constructed building. A vast land has been acquired in the DHA Multan for the construction of CIMS Multan and construction work has also been started there as well. This building would complete in 2018; after this the building constructed in front of CMH Multan would be handed over to Nursing College and CIMS Educational setup would be shifted into DHA. Till the completion of session of 2015’s admissions the seats would be upgraded to 150.